How Should You Gauge Your Home for Hazards and Disasters? Do you know how disaster-prone your home or community really is? Smack in the southern end of California—one of the nation’s most disaster-weary states—bloggers at inscenter.com started reaching out to clients years ago to share important data regarding residential risk assessment. In 1992, University of Colorado’s Dr. William Gray accurately forecasted Hurricane Andrew, and predicted a sharp rise in the number and severity of hurricanes in the near future. The website also flags eerily accurate predictions about floods, tornadoes, and earthquakes, too. While many states and localities have adopted building codes aimed at reducing damage caused by wind, flood and earthquakes, those codes may not always be enforced. Take Hurricane Andrew, for instance. Construction industry experts found that Andrew’s posted losses could have been reduced by 30-40 percent had existing building codes been properly enforced. Did you know that the Federal Emergency Management Agency (FEMA) maintains a Building Science Branch for developing and producing guidance on creating disaster-resilient communities? They conduct post-disaster engineering investigations for both man-made and natural hazard events. These building scientists take a lead in developing publications, materials, tools, technical bulletins and recovery advisories incorporating the most up-to-date building codes, floodproofing requirements, seismic design standards, and wind-related requirements for new construction, and the repair of existing buildings. 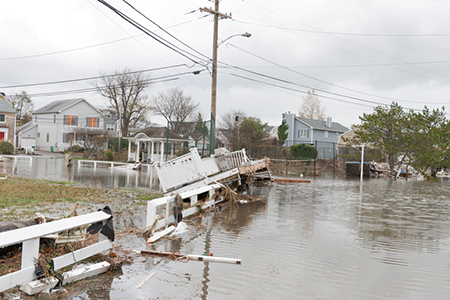 For property owners, FEMA’s Hazard Mitigation Assistance or HMA grants provide funding for pre- and post-disaster mitigation with a goal of reducing the risk of loss of life and property due to natural hazards. The agency’s Hazard Mitigation Grant Program (HMGP) assists in implementing long-term hazard mitigation measures following Presidential disaster declarations, and its Pre-Disaster Mitigation or PDM initiative provides funds on an annual basis for hazard mitigation planning—and the implementation of mitigation projects prior to a disaster. The goal of the PDM program is to reduce overall risk to populations and structures while reducing reliance on federal funding from actual disaster declarations.